Rey Santiago has a background teaching a variety of art courses in the School of Art at UTRGV. Mr. Santiago is also a co-founder of the McAllen Art Walk, and founder/manager of the Facebook group, Printmakers International, Santiago teaches classes in various art forms. He was the Master of Fine Arts Program Director and is a Professor at UTRGV. 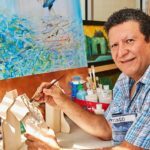 Reynaldo Santiago brings his extensive artistic experience and love of teaching to this Community Class program. Learn how to Draw or refresh your drawing skill with a professional Artist. Rey will help you develop your technical skills with unique drawing methods.